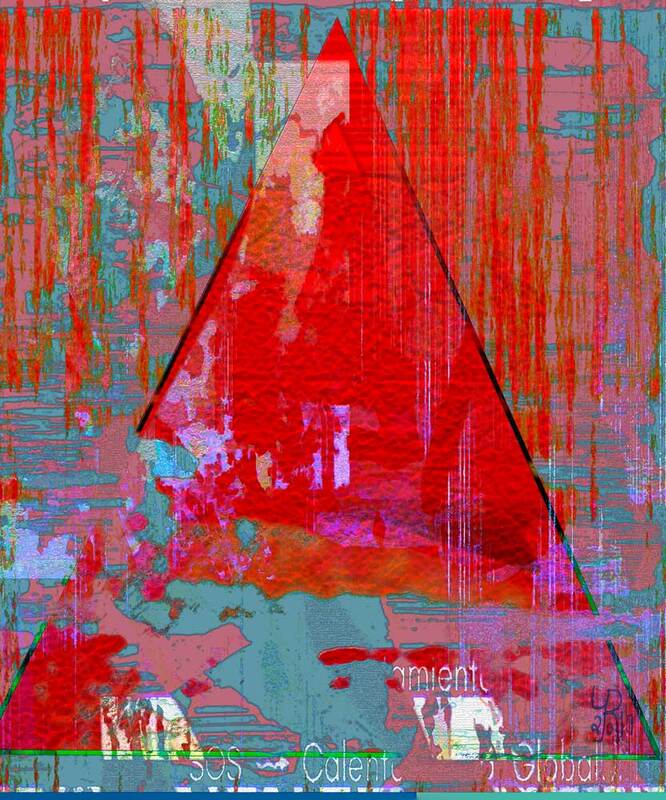 The Triangulation Series is a collection of digital images created by Yolanda del Riego (YR), constructed around the central figure of a triangle. Influenced by recent global uncertainties, the works in this series manifest her concern over the negative consequences of climate change and how these might lead to increased global turmoil. In my work, I try to materialize what I feel. Inevitably, it is a reflection of what I see or read —the images we are bombarded with on the television and in the press, or what scientists and politicians say. My perception is that of a changing, extreme and uncertain world. I have created these images in the hopes of raising awareness about climate change. I believe we as humanity must find a way to preserve Nature’s fragile balance. I try to find connections between my feelings and the complexities of the situation. I hope that others can also find their own connections and interpretations in my works. Works from the Triangulation Series were used in the Triangulation Through Science Communication art project that was created for the 4th European Conference for Science Journalists in Copenhagen (June 2017). Triangulation Series prints are available as 25 x 30 cm (approx. 10"x 12") aluminum prints (dye sublimation on aluminum panels) on WAIART.com. Yolanda del Riego often develops an idea through a series of variations, which allows her to explore a subject in-depth. Each variation takes her down a different path, and the Triangulation Series currently has over 93 variations. Common to all the variants in the series is the central figure of a triangle, which Yolanda del Riego uses as scaffolding for each individual composition.